Guerrilla Translation (GT) began its life as an activist translation collective of politicised, conscious translators. Our motivation is to create a plurilingual knowledge commons, accessible through GT’s websites (English and Spanish so far). But GT is also a translation/language agency offering a variety of communication services and its governance model ties these two facets together. GT’s model is an extensive overhaul of an orphaned open source governance protocol , which we have been substantially overhauled to better fit our needs. The adapted model explicitly incorporates the key practices of Open Cooperativism (a method combining the ideas of the Commons and Free Culture with the social tradition of the cooperative movement), Contributive Accounting (a form of accounting where contributions to a shared project are logged to ensure fair distributions of income and livelihoods) and, uniquely in this space, feminist economics and care work as essential elements . The full model can be read in the link above, but this article takes a narrative approach to answer two very simple questions: what is the model’s logic, and how does it work? The best way to understand it may seem counterintuitive at first. If Guerrilla Translation is a co-op, think of the co-op members as shareholders. Okay, like in an evil corporation, but bear with us. Each member is an owner, holding different types of shares in the collective. These correspond to tracked “pro bono” (commons-oriented voluntary work chosen by the translators) and “livelihood” (paid) work, as well as reproductive or care work. Shares in these three types of work determine how much is paid on a monthly basis. Where does the money to pay shares come from, and how are they paid? From the productive work performed by the worker-owners — in GT’s case, that work is written and simultaneous translation, copyediting, subtitling, and related services. We will explain the “how” below. In short, the more effort and care put into the collective, the larger the share. This is not a competitive, game-theory influenced scheme; it’s a solidarity based strategy for economic resistance that allows all members to contribute according to their capacity. All members create value; part of this value is processed through a market interface (the agency) and is converted into monetary value, which is then pooled and distributed to benefit all value streams. We call this value sovereignty. And, although the default decision making protocol is virtually identical to a traditional coop’s “one member, one vote” principle, your shares can influence decision making in critical situations, such as blocked proposal. How is this type of share-holding a contrast to that found in a corporation? Let’s break down the differences. While shareholders in a corporation accrue power through money, in our model, power is treated differently. The descriptions are power-to and power-with, accrued via productive and reproductive work taken for the health of the collective and the Commons. A corporation (or a start-up, or any capitalist business) employs wage labor to produce profit-maximizing commodities though privately owned and managed productive infrastructures. By contrast, in an Open Coop, we work together for social and environmental purposes while also creating commons and building community, locally and/or globally. The model allows us to turn our talents to worthwhile, not dead-end, causes. This is how we are practicing economic resistance. The Open Coop Governance Model in Guerrilla Translation: How does it work? We have established that Guerrilla Translators perform two types of productive work: pro-bono and paid (more about reproductive or care work later). If we take written translation as an example, both types are essentially identical. They are performed by the same team, using the same methods, working collectively, and sharing both the work and the eventual rewards. So, what are the differences? Pro-bono translations are the ones we choose to do ourselves, based on our enthusiasm for the original material and well aligned with our values. This doesn’t make us unpaid volunteers, though. It all boils down to the way we choose to distribute value. 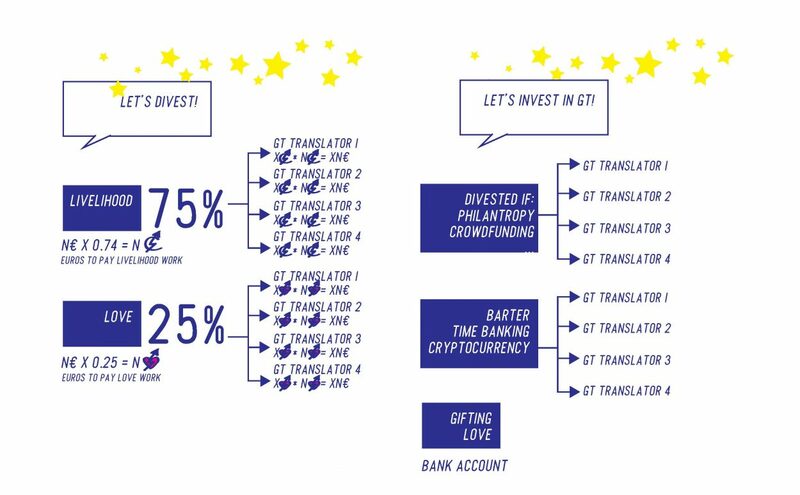 To us, a pro-bono or a paid translation has the same value – literally. We assign a (cost) value for all work we do, whether it’s a self-selected pro-bono piece for publication on our blog, or work contracted by a client. Our model of income distribution diverts a portion of every paid/contracted job towards fulfilling the value of the pro-bono work shares accrued by our members. This has several functions. First, it allows all members of the collective to gain an amount of income from their productive work, whether it was pro-bono or paid. Second, collective members are not put into competition among themselves for paid work, nor for the “best” paid work (based on the per-word rate). All work is valued internally at the same rate, regardless of the external prices which are variable. We have several pricing tiers for our clients. Metaphorically, there’s a pay-it-forward spirit involved here on the client side, but it’s more like pay-it-backward-and-forward internally in the collective. Clients with the greatest financial means who are aligned with our principles and wish to provide support for our knowledge commons are offered the top tier rate – this is still quite competitive, in fact at the lower end of typical translation pricing. There will be a penny or two per word that these clients are directly donating to our pro-bono shares and also towards any contract jobs we accept for clients with minimal or bare-bones budgets (including small co-ops, activist collectives, non-VC startups, and others). This sliding scale helps us nurture relationships and help support collectives and initiatives with the least financial means so it is fair for everyone. So far, we have mainly spoken about productive, tangible work: translations, editing, formatting. These tasks are mostly word-based and therefore, easy to quantify and assign credits. But what about everything that leads, directly or indirectly, to paid work? Searching for clients, project management, quality control, relationship and trust building, etc. – all the invisible work that goes into keeping afloat? This is reproductive work, or care work. In GT. we distinguish between two types of care work: that for the health of the collective, and that for the living beings within. When talking about caring for the health of the collective, we conceive it as a living entity or system, even a commons. The emergent values of this system are encoded in the governance model and embodied by the collective’s practices and legal-technical structures . To maintain a healthy collective we choose to honour our collective agreements, maintain our communication rhythms, and distribute the care work needed to make the collective thrive. Other ways to care for the health of the collective include coop and business development, seeking and attending to clients, making sure our financials are up to date and everything is paid, maintaining active relationships with authors, publishers, following through on our commitments… everything that you’d consider as “admin” work in a traditional agency or co-op, and on top of that, everything else that’s easily forgotten if you’re not doing it yourself. It’s literally invisible work to those who don’t acknowledge it, and work that many feel unjustifiably obligated to take on. The difference is that in Guerrilla Translation, these activities aren’t assigned to set roles. Instead, all “caring for the health of the collective” aka care work items are modular, easily visualized, and can be picked up by any collective member. In fact, those members may belong to one or more work circles, which steward certain areas, such as community, sustainability, networking, training, tech, etc. Additionally, when we speak about care work for the living beings who make the collective, we refer to the individual Guerrilla Translators who mutually build trust and intimacy to care for and support each other. Our cooperative practices should never be solely dependent on technology or protocols, including the governance model. These are only tools to facilitate and strengthen our collaborative culture. We believe that cooperative cohesion is primarily based on healthy, consent-based heterarchical relationships. To foster these we have committed to certain regular practices, such as mentoring — where we practice and document peer learning in the collective’s tools and practices — and mutual support — where we look after each other and care for our mutual well-being, attuned to everyone’s moods, needs and larger realities beyond the collective. Every member, whether in training or longstanding, is supported by a specific person who has their back. Every member has someone else’s back. Supported members have a safe space to express themselves to be cared for and heard within the collective. In this relationship, they may also be reminded of their commitments, etc. Conflict resolution is handled through the mutual support system, ensuring the distribution of personal care work. 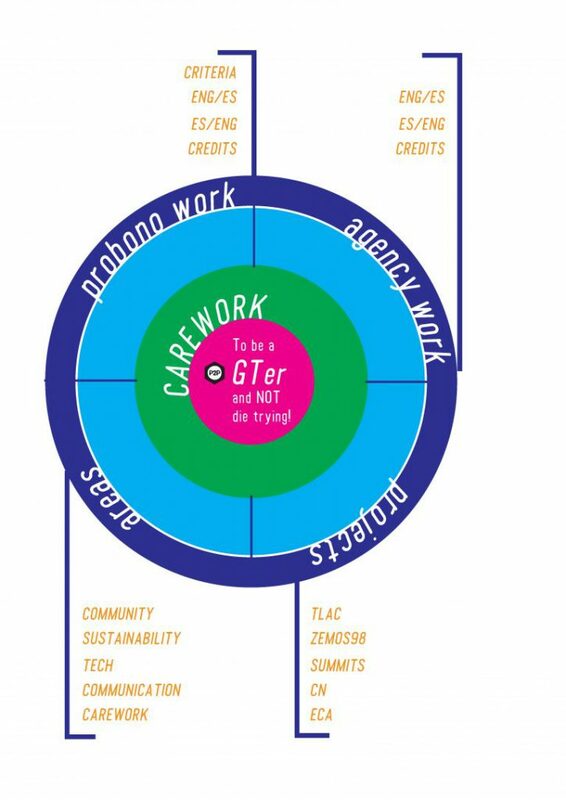 This has been a very basic overview of the model’s structural (credits and shares) and cultural (care work) qualities. If it raises more questions than it answers, or if you’re simply curious, you can read the full model. In the following sections, we will visualize the ways in which the model can work. Meet “Jill”, a Guerrilla Translator. Today she’s got a little bit of a time and has chosen an article to be translated. Maybe she proposed it, or maybe she picked it up from an existing list of material waiting to be translated. She contacts the author to let her know that GT would like to translate and publish the article, and asks for any required permission if necessary, etc. This describes a pro-bono translation. Jill will work alongside “María”, a copyeditor, and “Deb”, who’ll take care of the web formatting and social media promotion of the article. Livelihood Stream: Jill holds 67% of the “shares” (80 credits of 120 total), while María has 33% (40 credits of a 120 total). So out of 88,80 € allocated for the Livelihood Stream, Jill will receive 60,30 €. María receives 29,70 €. Love Stream: Jill holds 56% of the shares (90 credits of 160 total). María has 25% (40 out of 160) and Deb has 19% (30 out of 160). So, out of 30 € allocated for the Love Stream, Jill will receive 16,80 €, María 7,50 € and Deb 5,70 €. This totals 120 €. Magic! This is one situation. During another month, María may have done much more editing work, which takes less time than translation. Deb may have done more care work (more on that later) in both the Love and Livelihood streams. New people may have come in, maybe there’s been a windfall! The model can account for all these and other possibilities while also being dynamic in changing circumstances. It’s a “Team Human” model where the technology is kept flexible, and updates to serve the qualitative experiences of the collective, not just the measurable ones. 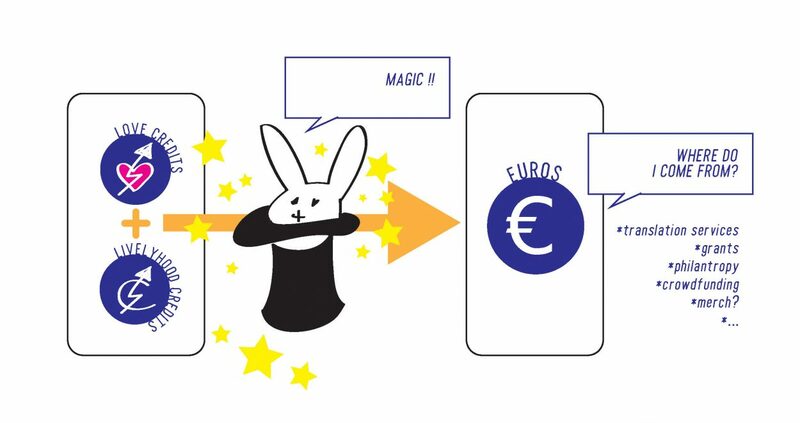 As you may have noticed, if 1 love credit equals 1 euro, in the example above we’ve only paid down 30 Love credits (25% of distributed funds) in euros. As 160 Love credits were created with the pro-bono translation, this still leaves 130 which haven’t been paid in money. The same situation is also applicable to Livelihood credits. As 75% of earned credits are divested, 25% will remain invested. Both types of credits (Love and Livelihood) can be divested or invested. Meanwhile, the sum of both are considered Historical credits. “Why so many? So confusing!” Yeah okay, but complexity allows for dynamism, nuance and catering for the different life circumstances and preferences of Guerrilla Translators. Reality is complex, and we want this to work in many real situations. For now, it’s important to make clear that the total amount of historical credits you have accrued reflect your investment in the organization. Whether it’s productive or reproductive work, it all gets tracked: this informs our governance. While in typical daily situations, all Guerrilla Translators have what amounts to “one member one vote” rights, historical credits come into play when making critical decisions such as blocked discussions, large structural changes to the governance model, and legal structure changes. In these rare yet important situations, votes can be weighed against an individual’s historical credits. Meanwhile, the invested/divested ratio helps clarify which members are prioritized for Livelihood work. Given that livelihood work gets divested at a 75% higher rate than Love work, we want to make sure that everyone has a chance to perform it, and that incoming work is offered to those with a higher invested ration first. Similarly, when measuring care work the invested/divested ratios helps clarify when individuals may be benefitting monetarily in lieu of caring for the collective (and its members). In these cases, the ratio is used to determine whether to divest less and agree to a renewed commitment to care work. Why have we chosen this model? Imagine that María is single mother with two kids to take care of. She wants to do socially useful work, but her material realities don’t allow her that privilege. By working with Guerrilla Translation she a) can perform paid/livelihood work for causes that matter and b) will not “lose” income by doing pro-bono work – ie, translations that would not otherwise get funded, but which should still be translated. In fact, she could spend most of her time just doing paid/livelihood work, and it would still benefit the pro-bono/love side (and vice versa). The model addresses the possibility of internal competition for “paid work” overshadowing the social/activist mission of the collective. In short, contributing to the Commons also makes your livelihood more resilient. In turn, you make the Commons more resilient by creating new commons and facilitating communications. The same can be said about care work. The more you demonstrate care for the collective, the more resilient and healthy it will be. If any member can’t contribute a similar proportion of care work as the rest, the member will simply have a proportional amount of their credits deducted and will be encouraged to compensate by committing to more care hours. In summary, the model is designed to find an optimum balance between paid, pro bono and reproductive work, with equity and continued dialogue at the center. Here we have touched on some of the characteristics of the model. The full version looks at every aspect in detail, including roles and responsibilities, onboarding and mentoring, the legal/technical backdrop, community rhythms, graduated sanctions, payment mechanics, decision making, and much more. Meanwhile, for easy reference we are providing below a summary of the model’s main featured and a list of the materials that influenced its creation. In short: Guerrilla Translators undertake both pro-bono and paid translation/editing work. These types of productive work are accounted for in internal credits (1 credit = 1 Euro), creating shares. Net funds held in GT’s account are then distributed on a monthly basis: 75% of these are used to pay down members’ agency (livelihood) shares. The remaining 25% is used to pay for pro bono (love) shares. Reproductive work is tallied in hours and distributed according to each members ratio of benefits vs. contributions. Below is the protocol for the model’s main characteristics. These can be applied as a bare-bones formula for other commons-oriented service collectives. Hyperlinks direct to specific sections of the full governance model text or to the Guerrilla Media Collective Wiki. Net earned income is distributed to fulfil members’ shares, allocated as: Paid (75%) and Pro-bono (25%). Care and reproductive work is valued as highly as productive work. “Care” means caring for the health of the collective and also caring for its individual members. Decision making is made by consent. Committed members’ votes are binding. Reproductive care work and productive pro-bono and paid work affect each member’s standing in the coop, as seen in their total credits over time. Punk Elegance: How Guerrilla Translation reimagined itself for Open Cooperativism (article) “The future of the project seems really bright because of the clarity of vision. Doing meaningful social and political work for groups and projects isn’t just an afterthought. The determination to build that into the org structure speaks volumes to the wisdom of the group: that investment of time is powerful, that translators and editors should be able to openly do passion work, following their hearts together, and that collective prioritization teaches everyone involved, and nurtures and hones shared values.” See also the Guerrilla Translation Reloaded Full Workshop Report for a more detailed account. Holo: The evolution of cloud computing (article) “This is an attempt to communicate Holo in simple, clear language (with a bit of playfulness to keep it entertaining)” and A Futurist’s View on Holochain, The Evolution Of Blockchain, (video). An easy to understand video walk-through on Holo’s architecture and potential. Stacco Troncoso (Spain) is the advocacy coordinator of the P2P Foundation as well as the project lead for Commons Transition, the P2PF’s main communication and advocacy hub. He is also co-founder of the P2P translation collective Guerrilla Translation and designer/content editor for CommonsTransition.org, the P2P Foundation blog and the new Commons Strategies Group website. 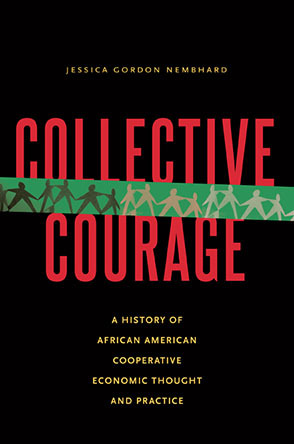 His work in communicating commons culture extends to public speaking and relationship-building with prefigurative communities, policymakers and potential commoners worldwide.